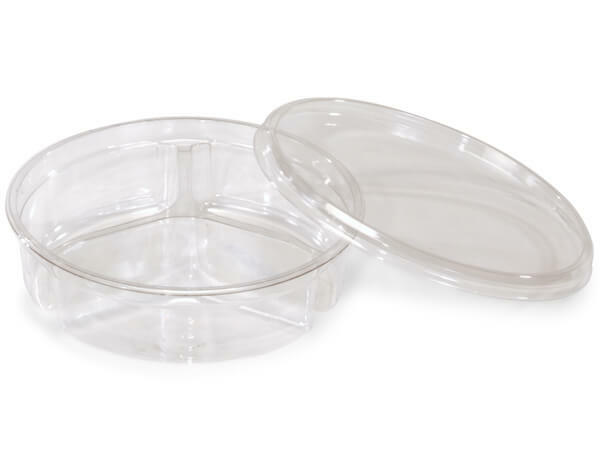 Medium Round Clear Plastic Lid fits all 6-3/4" dia. containers: RM18, RM32, RM32D3, RM32D4, RM40, RM48 & RM64. Medium shrink bands sold separately. Complies with FDA regulations for food packaging. Made in the USA. Clear Plastic Food Containers and Lids are made of recyclable clear PET and comply with FDA regulations for food packaging. Shrink bands are 200 gauge PVC. Containers, lids and bands are sold separately. Lids and bands fit multiple containers based on the same diameter of the container. Containers are great for storage and display of food items. Containers and lids are made in the USA.